Last Wednesday, October 25, 2017, the Citizens Coinage Advisory Committee (CCAC) held a meeting to discuss the design of the upcoming Congressional Gold Medal to honor Bob Dole. Bob Dole is a lawyer, former congressman of Kansas, former Republican Leader of the United States Senate, and 1996 presidential candidate who is renowned for his valiant service in World War II. In 1942, he entered the United States Army’s Enlisted Reserve Corps, rising to second lieutenant in the 10th Mountain Division. In April 1945, while fighting southwest of Bologna, Italy, in the Apennine Mountains, Dole was grievously injured in the upper right shoulder by German machine-gun fire and nearly succumbed to his injuries. For his service fighting in World War II, he was awarded five different medals, including the Purple Heart. He was additionally awarded the Presidential Medal of Freedom by President Bill Clinton, shortly after being defeated in the 1996 presidential election by the latter. Unlike the previous CCAC meeting, which concerned the design of the 2019 Apollo 11 50th Anniversary commemorative coins, the Bob Dole Congressional Gold Medal design was agreed upon rather quickly by the various members, who favored design BD-R-04. 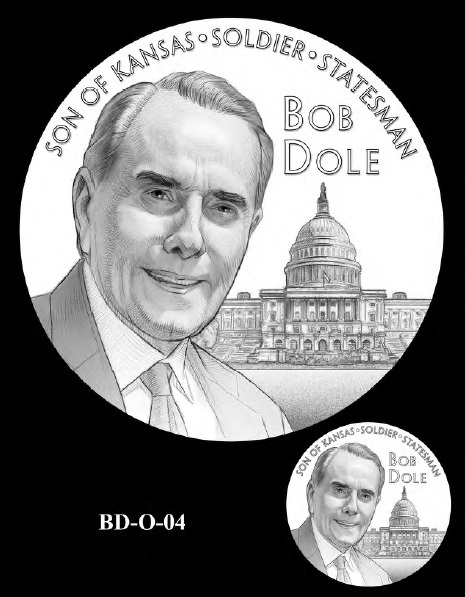 The obverse features an image of Bob Dole with the Capitol behind him. Inscriptions on the obverse include SON OF KANSAS, SOLDIER, STATESMAN, and BOB DOLE. 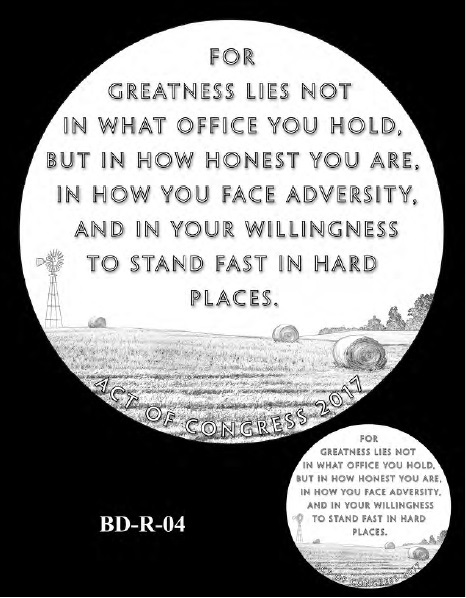 For the reverse, we are treated to a Kansas wheat field with a quote from then-Senator Dole: FOR GREATNESS LIES NOT IN WHAT OFFICE YOU HOLD, BUT IN HOW HONEST YOU ARE, IN HOW YOU FACE ADVERSITY, AND IN YOUR WILLINGNESS TO STAND FAST IN HARD PLACES. Additionally, ACT OF CONGRESS 2017 is displayed along the bottom. 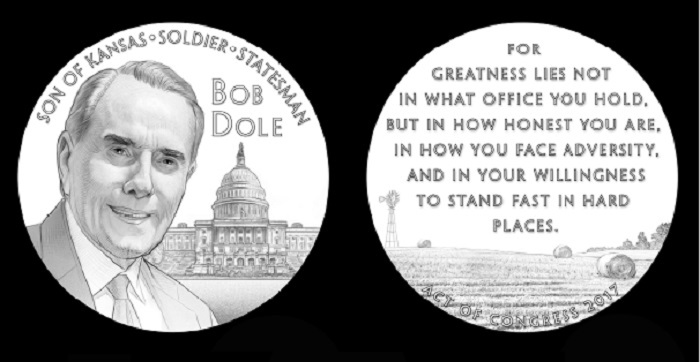 Out of consideration for Bob Dole and his family, Congress has expedited the production of the Congressional Gold Medal that is set to honor him. Some additional Congressional Gold Medals which honor the service of others in World War II were awarded to Filipino veterans, the Tuskegee Airmen, and the Monuments Men. The majority of the Mint’s military-related Congressional Gold Medals are available in 3-inch and 1.5-inch bronze versions as well. For more information on these medals honoring the service and bravery of the men and women in the United States military, please visit the Mint’s website. I am looking to purchase the Congressional Act Medal for the OSS WW2 for my father who was in the OSS The Carpetbaggers in Oxford England in 1942. I contacted the OSS Society and told me to contact the US Mint. His name was Irving Wagner I am his son.